Malikai, Shell’s latest deep-water project in Malaysia, has started producing oil. These videos detail the journey of its construction. 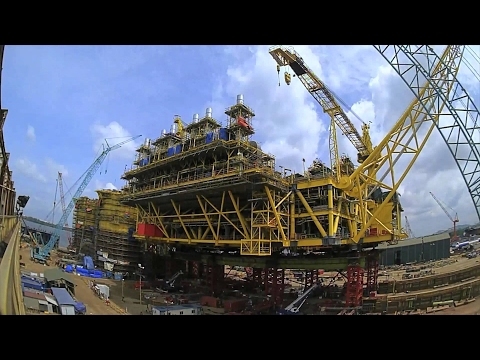 They include moving the 27,500-tonne platform to sea and attaching its 13,800-tonne topsides to its legs. The final video shows how engineers overcame one of the biggest challenges facing deep-water platforms: vibrations caused by water currents. Shell Malaysia’s Malikai Deepwater Tension Leg Platform project, in collaboration with the Universiti Teknologi Malaysia’s marine technology laboratory, through working to overcome the technical challenge of vibration, have developed new technologies that will be used in Shell’s future deepwater rigs around the world. Slow, rhythmic instrumental music building to a crescendo as the rhythm increases. The world’s ever-expanding population demands energy. And beneath the oceans lie vast supplies of oil and natural gas that could play a vital role in the world’s future energy mix. Bird’s-eye-view of a city street teeming with people. Pan across the surface of the ocean towards the horizon. Fast motion aerial view of busy city interchange at dusk, turning to evening, the highways steaking with light and the city skyscrapers lit with many lights. Fast motion bird’s eye view of a city skyline by night, a highway in the foreground streaking with the light. The days of easy oil are over. We had developed most of the shallow water opportunities. We had to go further afield into deeper waters, harsher environment. Close-up of Simon Ong. A bank of screens forms the blurred background, people sitting at the workstations in front of them. Wide shot of rigging equipment seen at dawn, lights shining from various levels in the semi-darkness and clouds racing across the sky above. Slightly panning bird’s eye view of an oil rig in the ocean. Close-up of underwater equipment, lights shining in the darkness. With decades of experience in deepwater projects, Shell has pushed the boundaries of what is possible to unlock the oil and gas resources the world needs. And one place where Shell continues to make deepwater history is Malaysia. Slightly panning bird’s-eye-view of an oil rig surrounded by deep blue water. Closer aerial view of the oil rig. Bird’s-eye-view of an oil drilling vessel out at sea, a support vessel moving beside it. Low angle view of an oil drilling vessel out at sea, cloudy blue skies visible above. Wide view of three workmen in safety gear surrounding a drilling pipe as it ascends, removing the safety clamps, cutting to a close-up of the pipe as it ascends. Close-up of a crane hook ascending at frame-left, part of the rig structure visible behind it and orange dawn skies over the glistening sea surface forming the background. Bird’s eye view of the sun rising over the ocean, part of the oil rig structure visible in the foreground. Aerial view of a rig in the ocean. Fast motion bird’s-eye-view view of an oil platform, clouds racing past in the skies above. Bird’s eye view of buildings from which Malaysian flags can be seen flying. Worm’s eye view of the Tension Leg Platform blue skies and cloud visible beyond. Using ground-breaking technology to develop previously inaccessible oilfields, the Malikai deepwater Tension Leg Platform project is the first of its kind in Malaysia. Operating at a depth of 500m, the platform is capable of producing 60,000 barrels per day. Pan over glistening waters of the ocean, panning up to a high angle view of the TLP in the shipyard, cutting to a closer side view and pan of the upper levels of the platform. Bird’s-eye-view of the helipad and platform, cutting to a more distant aerial view of the TLP in the shipyard. Worm’s eye view of the TLP, blue skies and cloud visible beyond. Wide view of the TLP, panning slightly upwards, the shipyard and blue skies and seas forming the background. Rotating aerial view of the TLP in the shipyard. In the deepwater operation of oil and gas, it is quite essential to use production platforms such as the Tension Leg Platform – or we call them TLPs – and to connect the TLPs to the seabed where we will transport the oil or gas. We use risers. And basically risers are very slender pipes and these pipes are very long in deepwater, maybe up to 1,000, 2,000m. Close-up of Prof Adi Maimun Abdul Malik, against a blurred background. Animated graphic of the TLP in deep water, with support vessel and structure alongside. The animated sequence begins with a bird’s-eye-view of the TLP, rotating down to a front view and zoom into the platform where the drill pipes can be seen. This cuts to a low angle view of the base of the TLP underwater and pans down to show the length of the slender risers reaching down towards the seabed. The animation then zooms and rotates around the point where the risers meet the seabed, finally pulling back to a wider view of the risers and legs of the platform on the seabed. Eerie instrumental music with synthesised sound effects. Freezing temperatures, total darkness and crushing water pressure makes it difficult to extract energy from deep water. Aerial view of an oil drilling vessel and support vessel on grey seas, cutting to a wide view of workmen on the deck of the vessel at night, the lights of the platform visible in the distance, followed by a closer view of a cluttered deck seen through streaking rain. Close-up of a woman seated in front of a bank of screens, operating the vessel’s intercom system as she speaks into the microphone. Close-up of equipment and chains underwater, barely visible in the dark water. Mid-view of workmen at night, bending around a large chain to grab hold of the equipment it has brought up, cutting to another dark underwater shot of chains and other equipment. Close-up of a signal lamp on the vessel shining in the night sky, the lights of the drilling vessel visible in the distance. But for Malikai, one of the major technical challenges is vibration. Close-up of a choppy sea surface, cutting to a close-up of chains submerged in swirling, rough waters. Just imagine these slender pipes can easily vibrate. And this vibration can be quite immense when there is a strong current flowing around them. From this large motion, the risers may knock each other or they can be pulled out from the seabed or from the TLP itself. Close-up of Prof Adi Maimun Abdul Malik, as previously described. Animation of the TLP where the risers and legs meet the seabed, showing the pipeline with dark lines along the seabed. White arrows which depict the flow of ocean current move inwards from frame right in strong, straight lines, rotate around the risers and move out towards frame-left in a less stable path. The animation zooms to a closer view of the risers and legs of the platform on the seabed, and shows the white arrows entering from frame-right and moving in circular motion around the risers before exiting frame-left. The pipe will vibrate. That vibration will cause damage to the pipe and its field life will be significantly reduced if we don’t mitigate it. Close-up of Shankar Bhat against a dark background, the TLP scale model appearing frame-right. Animation of the risers and legs of the platform on the seabed, zooming back out to the wide view of where the TLP risers and legs meet the seabed, showing the pipeline with dark lines along the seabed. Shell collaborated with the Universiti Teknologi Malaysia’s marine technology laboratory to overcome the issue of vibration. Low angle panoramic view of the Universiti Teknologi Malaysia, cars coming and going in fast motion and green fields and blue, cloudy skies forming the background. Wide view of the entrance to the university from inside the premises, vehicles shown passing through the entrance. Low angle panoramic view of a wall displaying the university’s name set in the grounds of the university. Grass, shrubs and trees, and blue, cloudy skies form the background. Low angle close-up of a signboard depicting Makmal Teknologi Marin / Marine Technology Laboratory, with the lab buildings in the background. Panoramic view of grassy fields, trees, a lake and blue, cloudy skies, panning over the lake to reveal buildings. Instrumental music with piano riffs, strings in varying rhythms, with synthesised sound effects. Tests were carried out to develop new technologies to be used in Shell’s future deepwater rigs around the world. Rotating wide and closer views of the scale model of the TLP shown against a black background. In UTM, we have this hydrodynamic, or we call it the towing tank, which is quite a significant size for a university to have – 120m long. Not many universities have these kind of facilities. Low angle view of the towing carriage approaching along towing tank, cutting to a wide view of men in hardhats standing at the controls of the carriage, and then to a high angle view of the towing carriage with the men in the background. Scale models of risers are fitted with different fairing designs and are towed down the tow tank at various speeds to simulate different deepwater ocean current conditions. And data is then collected and analysed to identify the most efficient design for Malikai’s specific ocean environment. Front view of the long towing tank, the carriage at the other end of it, dissolving to various views of the carriage approaching. Wide front view of the carriage cutting to a side view as the carriage first speeds and then moves slowly down the tank. Point of view shot as from the carriage of the track below along which it is moving. Fairings are attached to the risers. These fairings channel the water current smoothly around the risers, dramatically reducing the swirling eddies that cause vibration. A white screen with the header Horizontal Riser VIV Test alongside which the Shell and UTM logos are displayed depicts two screens below. The bare riser at frame-left is vibrating and moving irregularly in the water. The riser with fairing at frame-right shows no vibration. A white screen with the header Tandem Riser VIV Test, alongside which the Shell and UTM logos are displayed, depicts two screens below. The bare risers at frame-left are moving erratically in the water. The risers with fairings at frame-right move straight through the water with no visible vibration. We’re currently working with Shell in the development of the new riser technology that will be a more reliable and safer and cost-effective solution to the deepwater project. Close-up of Dr Henry Kang against the background of the towing tank area. Rear view of Dr Kang and a colleague at the controls of the towing tank carriage, the tank visible ahead of them. A screen split into four, each quadrant showing a view of the TLP scale model in water. Close-up profile view of one of the men at the controls of the towing tank carriage, cutting to a close-up of his hand pressing a button on the controls and a buzzer sounding. Dr Henry Kang is one of the recent beneficiaries of Shell’s educational sponsorships in Malaysia and has spent years in America studying for his PhD on a Shell deepwater internship. Wide side view of Dr Kang walking towards the other two men in the towing tank area, cutting to a mid-shot of the three men looking down at a screen off-camera, to a close-up of Dr Kang gesturing to the men as he talks, and to a rear view of Dr Kang leaning over to point at something on the screen as he talks to the men. The internship in Shell is very meaningful for me because it helped me to build up my professional knowledge, especially in deepwater riser engineering. Close-up of Dr Henry Kang, as previously described. High angle view of Dr Kang on the towing tank carriage, instructing one of the men, cutting to a close-up in profile of Dr Kang as he explains. When we invest in a country, we are not only investing in the short-term; we’re investing for the long-term. Just bringing money without developing the local human resource and human capital is not going to be sustainable. So that’s why we invested in sponsoring students for overseas studies. All this is part and parcel of the long-term sustainable philosophy that we have. Close-up of a panel of buttons, panning across a bank of screens and the men seated in front of them, and cutting to a wider side view of the men seated at the curved workstation. Close-up of a hand pressing a button on the panel of buttons, panning up to show the top row of coloured lights on the panel. Mid-shot of the men seated at the workstation, looking at screens, one using a telephone, another using a two-way radio. Close-up of Simon Ong as previously described. Close-up of a pair of hands operating a computer mouse while keying something on the keyboard. Point of view shot of one of the men at the workstation, seen from behind the bank of screens. Close-up of a finger pressing a button on an intercom system, cutting to a side view of the men at the workstation again, the man in the foreground speaking on the microphone of the intercom. Rear view close-up of one of the men at the workstation speaking into a two-way radio, cutting to a mid-view in profile of the same man speaking on the radio. Shell’s collaboration with UTM has not only produced safe and economically sustainable deepwater oil extraction but also paves the way for new deepwater exploration, continuing to fuel Malaysian progress for decades to come. Mid-view in profile of Dr Kang pointing to a screen and gesturing to his team as he talks, cutting to a close-up front view of the three men as they look down at the screen, now off-camera. Aerial close-up of the helipad of the TLP, pulling back to a wider aerial view of the TLP, finally cutting to a low angle wide view of the TLP in the shipyard, clouds racing across the blue skies above. Wide fast motion view of the harbour, the TLP atop a transport vessel filling frame-right as it begins to move away from the quayside and out to sea. Wide shot of the TLP atop the transport vessel, surrounded by ocean. Aerial view of the TLP atop the transport vessel and moving away into deeper waters. Panning aerial view of the TLP out in deep water, cutting to a high angle view of the platform and support vessels in the ocean surrounding it. Malikai TLP load out and float off. Bright instrumental music, including strings, with a folksy/dance rhythm. Bird’s eye view of the base of the Malikai tension-leg platform, panning up to an aerial view of the TLP in a shipyard, revealing the waiting heavy lift transport vessel at the quayside. Low angle view of the TLP in the shipyard, the sky forming the background, changing angles to a closer worm’s eye view of another of the sides of the platform, panning down to a front view. Malikai is one of Malaysia’s largest deep-water oil platforms. Wide high angle view of the TLP in the shipyard, various buildings and crane structures scattered about, with cloudy blue skies forming the background. Bird’s eye view of the TLP, the water and skies beyond forming the background. Close-up of one of the tension legs. Wide view of a workman in safety gear welding something on the TLP. Wide view of a large group of workmen in hardhats congregated in the shipyard as another man in safety gear speaks to them. Close-up of the large mechanism beneath the TLP which is sliding it along. Fast motion wide view of the TLP sliding along the tracks from the shipyard to the quayside. Clouds flit by in a blue sky in the background. Close-up front view of the base of the TLP sliding along the tracks. Worm’s eye view from under the TLP as it moves along the tracks. Whirring sound as the TLP moves along the track. 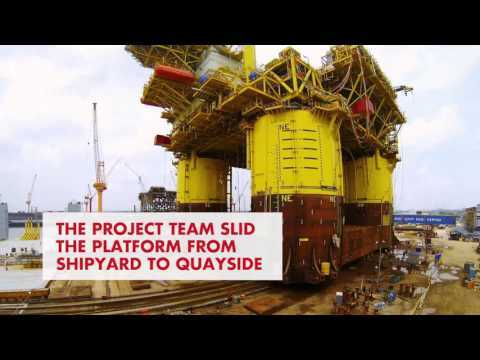 The project team slid the platform from shipyard to quayside. Aerial view, panning up slightly, of the TLP reaching the transport vessel. Close-up of the quayside with the TLP lined up with the waiting transport vessel. Fast motion view of the cloudy blue skies turning dark and lights appearing around the quay as the TLP starts to slide onto the transport vessel. High angle fast motion view of the TLP, once more in daylight, sliding onto the transport vessel. The team loaded it onto a transport vessel. Wide fast motion view of the harbour, the TLP atop the transport vessel filling frame-right as it begins to move away from the quayside and out to sea. The vessel carried the platform offshore into deeper waters. Panning aerial view of the TLP out in deep water, cutting to slightly high angle view of the platform and support vessels in the ocean surrounding it. The team released the platform, letting it float by itself. Transporting it from land to sea took 10 days after more than a year of planning. Wide view, panning slightly, of the platform with support vessels nearby on the ocean. Extreme aerial view of the platform surrounded by deep blue seas and various support vessels. This major feat takes Malaysia one step closer to unlocking vital energy resources. Dramatic music – drums and strings. Very large piece of machinery, moving slowly across screen. Major milestone for Malikai Deep-Water Project, Malaysia. Close up of part of machinery as it moves. A man in overalls walks next to it on scaffolding. Camera pans out to show how large the machinery is at it moves above the man. Wide shot of work site with large machinery in the middle. Shot from below, looking up as machinery moves across. A crane can be seen underneath. Sped-up footage of workmen working on a part of the equipment as it is moved up. Shot from ground level showing jack lifting the equipment. Wide shot as machinery is lifted. Legs of jack shown as it is cranked up. Shot looking up as the jack is being raised. Wide shot of the work site – machinery in the middle surrounded by cranes. Another shot of the jacks rising. Shot looking down at jacks from a platform on the machinery. The topsides are skidded onto the hull. Wide shot of worksite, showing the machinery fully raised up and being moved across on top of the hull. Shot looking up as the machinery moved across. Another shot from a different angle as the machinery is slid across onto large columns. Aerial shot looking down at work site. Malikai will unlock much-needed energy for the future. Group of workers in hardhats and overalls grouped together in front of machinery for a team photo, cheer with fists in the air. Shell's latest deep-water project off Malaysia strengthens the country's expertise in unlocking energy from beneath the ocean's depths. Shell’s first deep-water project in Malaysia uses advanced technology to safely produce and pipe oil from the Gumusut-Kakap field. How a visit to a shopping centre led to the use of virtual reality in safety training for a new oil production project in Malaysia.